So earlier this month I flew to St. Louis, MO. It was a hastily put together trip. Given the time constraints, I actually had to buy plane tickets before I knew for sure I'd have a reason to fly out there. Things worked out as hoped, however, and I did indeed have a reason for the trip. I've never been to St. Louis. Even though my ancestral family first settled in Missouri in the mid-1800's and still predominantly lives in the area, I have to admit that I know very little about the regional culture and so on. Regional culture can encompass many things, of course - music, entertainment, customs, etc. But when I travel, I primarily zero in on the food aspect. Why? Well, mostly I like food. I like a wide variety of food, and generally make a point of sampling the local fare whenever I travel. If I have time, I try to check out other forms of local culture as well, but I don't always have time in my schedule for those types of things... especially if I'm travelling for business. I always have time for food. Always. And I usually do my best to try some food specific to the region - especially if I've never tried it before. I'm a pretty good sport about trying anything once, and I've had some pretty exotic things. I've had kangaroo and Vegemite in Australia (no, not together in the same dish), balut in the Philippines, something I watched being made but still have no clue what all was in it in Singapore, alligator in Florida, some pretty crazy things in S. Korea, king crab in Alaska, crab cakes in Maryland, friggin drop dead awesome beef brisket in Austin, cioppino in San Francisco, pizza in New York (and Chicago) and, well, you get the point. Given the short notice for this particular trip (as well as the duration of the trip; only two days), I had precious little time to do food research. Nearly zero time, actually. It was all done via Google on my iPhone while waiting at the gate for my outbound flight. I tried to think of what St. Louis might be famous for... BBQ? Hmm, not really... that seemed like more of a Kansas City kind of thing. But wait a minute, isn't there such a thing as St. Louis-style ribs? It's one of the cuts offered in restaurants across the country. Surely if they earned the namesake, there must me something to the ribs in St. Louis... so ribs was quickly adopted as the target for the trip. A couple quick Internet searches while groups prior to mine were boarding... ribs... good ratings on said ribs... appearing on the map as being between the St. Louis airport and my destination... no? Damn. Well, how about at least not too far out of the way and easy access to the freeway that goes to my destination? Bingo. Roper's Ribs. I'd have to head away from my destination on the freeway for a few miles to get there but not too far, and the access to the freeway looked good. Other than its location on a map and the fact that I saw a few good ratings, I knew absolutely nothing about Roper's Ribs... but that's OK, that's how I roll sometimes. I had no idea how small it was. Turns out that it's mainly a take-out place. The 'dining room' is probably about the size of one of my kid's bedrooms and only has four small tables (one of the tables is pictured here). It reminded me of a similarly small BBQ place in Colorado Springs, except none of the tables (or chairs for that matter) matched in the Colorado Springs restaurant. 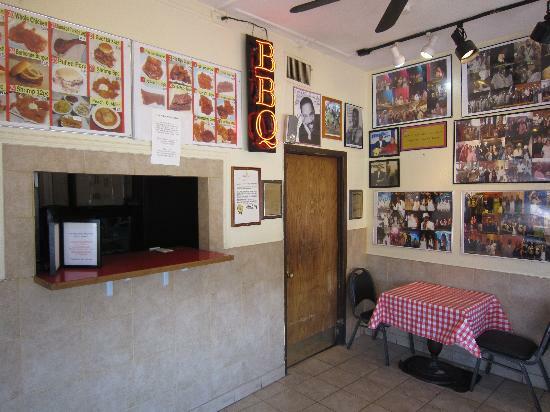 The BBQ in Colorado Springs hole-in-the-wall was outstanding, though, and I hoped for more of the same here. I placed my order - a ribs and shrimp combo - and sat at the table by the front window. While I waited, a steady stream of customers came in to either pick up orders that they had called in or place orders for pickup. In all, I probably heard at least a dozen orders being placed... and every single order... and I mean EVERY... single... order... had a common item in it. Snoots. Ribs & Snoots. Shrimp & Snoots. Rib Tips & Snoots. Snoots by themselves. Snoots, Snoots, Snoots. I found myself wondering... "WTF are Snoots?" "This place ain't called 'Roper's Snoots' dammit... are you people insane?" I didn't see any awards for Snoots on the website (or on the walls in the dining room for that matter). I wondered if there was some secret unadvertised cheap special for these things called Snoots, but there wasn't. I wondered if I should change my order to include Snoots. I wondered if I should order Snoots-to-go after eating my meal. I wondered if some random person sitting in the dining room would take offense if my fork accidentally stabbed one of the Snoots on their plate. I thought better of it after reminding myself that I may very well be the only white person in a one mile radius (nothing wrong with that at all in my opinion... but I was obviously a guest in the neighborhood and should act accordingly). I mostly wondered what I was missing out on. Before long, they called my number to let me know my order was ready and I went to the window to retrieve my Snoot-less styrofoam container. The ribs were very good, although not the absolute best I've ever had (granted, I've been to the famous Memphis-in-May national rib competition, so I've had some damn good ribs). The shrimp actually stunned me. They were excellent. Big, firm, juicy, excellent batter... that was the shocker for me. I expected the ribs to be great and the shrimp to be passable like they are in far too many restaurants across the country. These shrimp, in my opinion, would justify changing the name of the restaurant to "Roper's Shrimp"... but I guess that wouldn't have the same ring to it. I left Snootless, but I'll be back. I see several trips to St. Louis in my future... another one is already booked in September. The folks at Roper's - the staff as well as the random customers I chatted with - were all super friendly people. Big smiles, great food, and friendly conversation - what more can you ask for? I can ask for Snoots, that's what. Next time I drop in, it'll be a Shrimp & Snoots combo, please. if intarwebs is accurate, snoots is like chicharron or pork rinds. i'd eat it. yep, that's my conclusion as well. i'm definitely going to give them a go next time i'm out there. Engineer, father, pool player on a quest for pool excellence. Historically, I've succeeded in achieving what I set out to do and pool is a good match for my overall skill set so I have no doubt I'll get there... one step at a time.